Sometimes, a simple item that allows children to explore can inspire.A set of binoculars can make looking at the world more exciting. Whether it is a bird in a tree or a flower on a mountain, seeing beyond the obvious can open a whole new world. By making science entertaining, kids can develop a love of learning that will continue throughout their lives. 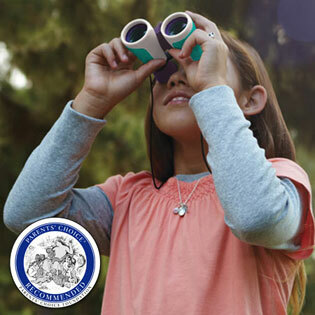 Nancy B's Science Club Binoculars and Activity Journal allow kids (and adults) to see beyond what is in front of them. With four times the magnification, the binoculars can help see beyond the naked eye. From looking at birds taking flight to animals climbing up a tree, watching animals within nature can help kids understand more about science. With the Wildlife activity journal, everyone can learn more about the world around them. These binoculars are useful for kids and adults. While easy to use for smaller hands, these binoculars are sturdy. The built in compass can help everyone navigate while exploring. As kids become more familiar and confident, the activities can become more challenging. Hopefully, these fun activities can create a love of nature and science. The Nancy B's Binoculars and Wildlife Activity Journal can be purchased online at Educational Insights for $15.99. That is so fun! I remember going my mom bringing her binoculars one time when we took the kids somewhere...they had a blast! Those binocular are so cute. I want a pair for my daughter. My son would love a pair of those binoculars! These are cool!! What kid doesn't love binoculars?! My boys keep stealing my husband's to see what cool things they can find behind our house!